Sony Pictures Home Entertainment has just added Jumanji: Welcome to the Jungle to its line-up, scheduling a 4K UHD, Blu-Ray Disc and DVD version of the action adventure for release in late March. Aside from the feature film itself, the release also comes with a number of bonus features. 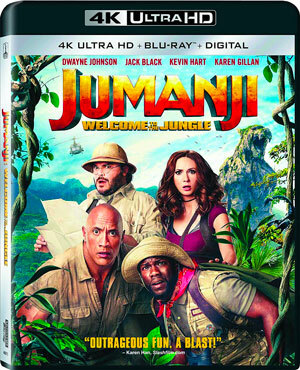 The DVD version, for example, will arrive supplemented by the “Jumanji, Jumanji” Music Video by Jack Black and Nick Jonas, as well as a Gag Reel and the Featurettes “Journey Through The Jungle: The Making of Jumanji,” “Meet the Players: A Heroic Cast” and “Attack of the Rhinos!”. The Blu-Ray Disc version will include the same bonus features but will add a number of Featurettes to the mix, such as “Surviving the Jungle: Spectacular Stunts!” and “Book to Board Game to Big Screen & Beyond! Celebrating The Legacy of Jumanji”. Jumanji: Welcome to the Jungle will be in stores on March 20 for $29.99 on 4K UHD, Blu-Ray Disc and on DVD.